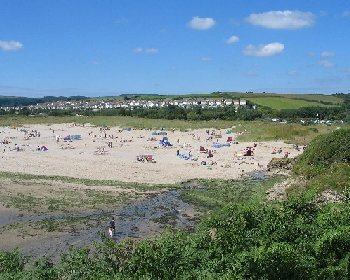 Par Sands is a wide sandy beach popular with families. There is a huge expanse of sand at low tide and there is still some sand left at high tide. Facilities are close to the beach. No details available. See Beach Safety Guide. Level access to the beach at Par Sands. The car park is next to the beach. Dogs allowed all year on Par Sands Beach. The village of Par is less than 1 mile from St Blazey and 4 miles from St Austell. Approach St Blazey from the east or west on the A390. In St Blazey there are several routes to Par, including the A3082 (signposted to Par and Fowey). Follow the A3082 until a roundabout and here turn left (signposted to Par). Take the next left (again signposted to Par and Fowey). Follow this road under the railway bridge into Par. Here there is a one way system in operation. Follow the A3082 left around Par. Then at the next junction turn right and follow the A3082 under a second railway bridge, then turn right (signposted to Par Beach) and follow this road to the Par Sands car park. Alternatively, if approaching from the east on the A390, just after Lostwithiel turn onto the Fowey road the B3269. After several miles, turn left at a roundabout onto the A3082 and follow the road to Par Sands. 1 large car park by Par Sands Beach. Update June 2016. It is reported that the toilets are closed. Pub, café, shop at Par Sands. Picnicking area at Par Sands.